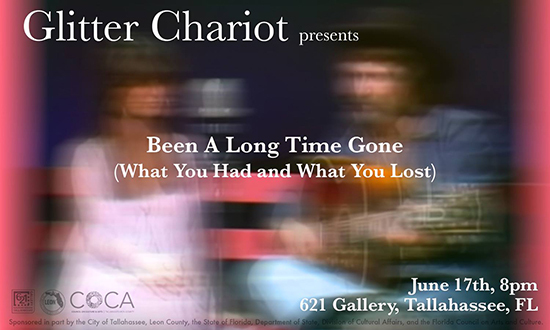 On Friday, June 17th, 621 Gallery is incredibly excited to host “Been A Long Time Gone (What You Had and What You Lost)”, a new performance by Glitter Chariot, featuring: Chuck Carbia, Kelly Boehmer, Lexi Braun, Paul Harvey, Patrick McKinney, David Dowden, Danny Wood. Part glam rock and part performance art, Glitter Chariot performances are charged with emotion, set and character design, and reimagined melodies. Glitter Chariot performances are difficult to put into words, but that won’t stop us from trying: ethereal, ephemeral, melodramatic, spectacular, haunting, heartbreaking, raw, and often sparkly. The performance will take place in the back of the main 621 Gallery space, and is sure to break (and potentially mend) some hearts.